How Long Does a Trunk Lock Actuator Last? The trunk of a car is designed to transport anything that the driver has that will not fit in the cabin of the vehicle. There are a variety of different mechanisms that allow the trunk to function as intended. Most of the modern vehicles on the market have a key fob that will allow you to open the trunk without having to put the key in the lock cylinder. In order for this type of system to work, the trunk lock actuator will have to work. This actuator will read the signal that your key fob puts out and then subsequently open the trunk when need. Every time that you attempt to get into your car’s trunk, this actuator will have to go to work. Like any other motor or actuator on your vehicle, the trunk lock actuator is intended to last the life of the car. In some instances this will not always be the case. If the lock actuator is not working when using the key fob, then you will need to take the time to see if the button in the cab of the car will unlock it. This will allow you to narrow down the source of the problems that you are experiencing. By doing this type of troubleshooting, you will be able to avoid trying to replace the wrong elements to fix the issue. Usually, if the trunk lock actuator has gone bad, you will be able to unlock the trunk by using the lock cylinder. While this method is not nearly as convenient as just pressing a button, it will get you by until you are able to get the actuator replaced. In some cases, bad wiring or a burnt fuse can be the issue that is causing the actuator not to work. By letting professionals troubleshoot the issues you are having, you will find it much easier to get the right repairs performed. Getting the broken trunk lock actuator fixed can be easy when using the right auto repair professionals. 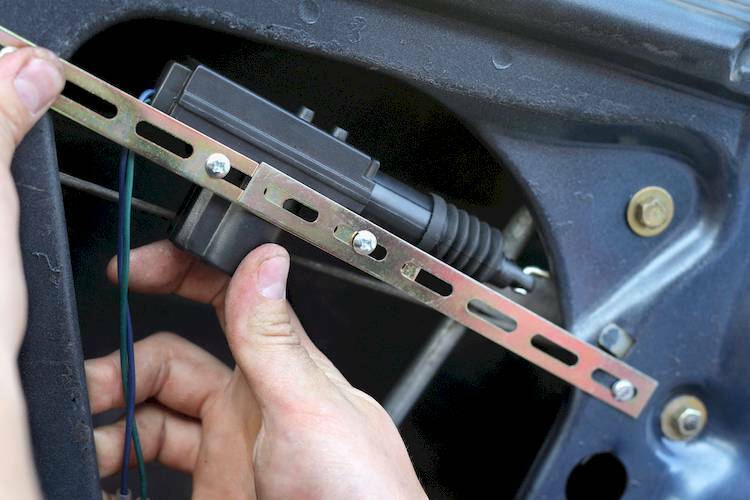 Have a certified mechanic replace the failing trunk lock actuator to eliminate any further problems with your vehicle. Q: My Mazda infotainment system's button is pushed in how can I repair this at home? Q: How do I use the remote entry power liftgate? The remote entry power liftgate allows you to open your trunk with your remote entry transmitter. To use this feature, press the Trunk button on your transmitter twice within three seconds.